Vector supports you in the development, analysis and optimization of electronic vehicle networks and ECUs with various hardware components. Our product range includes several interfaces that connect your PC to bus systems and networks such as CAN FD, LIN, J1708, Ethernet, FlexRay or MOST. Data loggers, scalable calibration and measurement hardware as well as modular test hardware for HiL systems complete the portfolio. In addition, you can count on Vector's competent support in the development of ECUs for prototypes and small series productions with the Vector Controller hardware - from specification to production qualification. To get more detailed information about our accessories like Cables and Adaptors, Vector PCMCIA, CardBus and ExpressCard Drives or Accessories for GL Loggers and CANlog, please click the following link. The Vector network interfaces have a flexible connection to the respective bus system via interchangeable bus transceivers. The user has the choice of several bus transceivers for CAN (FD), LIN, K-Line, FlexRay, Sensor and J1708 bus systems. The transceivers are available as piggyback boards. CANlog 3 and CANlog 4 record the data communication of CAN and LIN systems. Messages will be received, saved, and evaluated according to the loaded configuration. FRstress generates reproducible disturbances in FlexRay systems. It can generate protocol errors as well as manipulations in bus physics that are activated by trigger conditions. FRstress is an easy-to-use hardware module whose integration in the system differs depending on the desired fault injection. The GL loggers are special automotive data recorders which can be used in test vehicles or on test benches. They record measurement values and acquire the data communications of CAN, LIN, FlexRay and MOST150 bus systems. In addition, GL loggers store time-synchronously measured values from internal ECU parameters via CCP/XCP and diagnostics, digital and analog inputs and GPS data. Vector Controllers are ECUs that can be used universally for vehicle communication. They are perfect for rapid development of functional samples and use in small series productions. VH6501 is a flexible yet compact CAN (FD) disturbance hardware and a network interface for CANoe combined in one device. It enables you to generate disturbances of almost any kind precisely and reproducibly in CAN (FD) networks. This makes it the ideal tool for testing the fault handling of nodes. The VN0601 is a compact and powerful interface for ARINC 429 bus systems. The interface gives developers of networked electronic units in aircrafts (Line Replaceable Units or LRUs) a high-performance interface solution for testing and bus analysis. The CAN/LIN network interfaces VN1530 and VN1531 are ideally suited for accessing CAN and LIN networks via the PCIe interface. Due to its various channel combinations for the bus connections to CAN(FD), LIN, K-Line and SENT VN1530 and VN1531 are optimal interfaces for test benches, test PCs and rack use. The VN1600 interface family provides a flexible and fast access to CAN (FD) and LIN networks. While the VN1610/VN1611 with 2 channels focuses on minimum size and weight, the VN1630A/VN1640A with 4 channels is designed for flexibility and IO support. The VN1630 log provides additional recording functionality. The VN2640 is a high-performance hardware interfaces for the analysis, simulation, and testing of MOST150 networks. The interface has a fast USB2.0 interface and is controlled by a high-performance 32-bit processor. Even at large quantities of data, several devices can be used simultaneously with short reaction times, which is especially advantageous for the analysis of ring position-dependent procedures and high-load tests. The VN5610A and VN5640 are compact and very powerful interfaces with USB host connection for accessing Ethernet and CAN (FD) networks. There are many use cases for the VN5610A and VN5640 such as Ethernet monitoring, frame- as well as load generation or synchronous tracing of Ethernet frames with other bus systems such as CAN. 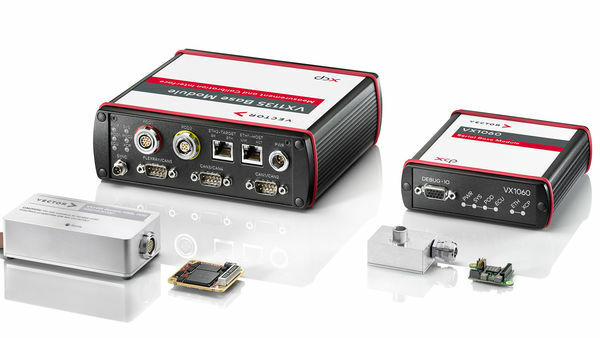 Furthermore the VN5640 interface offers with its numerous Ethernet channels a powerful platform for extensive analysis, simulation or complex testing tasks within an Automotive Ethernet network. The FlexRay network interface VN7610 is ideally suited for the development, simulation or testing of FlexRay networks. The connection possibilities via USB make it universally applicable (for example in the laboratory or during a test drive). Due to its very compact design the VN7610 is especially suitable for mobile applications. In addition to FlexRay bus connection, the interface provides access also to CAN FD bus systems. The various channel combinations for the bus connections makes it an ideal interface for the laboratory or developer workstation. Due to its compact and robust design, it is also suitable for mobile applications. The VN8810 is a compact and intelligent diagnostic hardware device for various applications involving vehicle diagnostics. Accessing the vehicle is easily done via the OBD socket. The reprogramming of ECUs or the execution of diagnostic scripts is handled by one single hardware device. Once flash packages or scripts have been transmitted, the VN8810 executes them autonomously in standalone mode or optionally controlled via a smartphone or tablet. 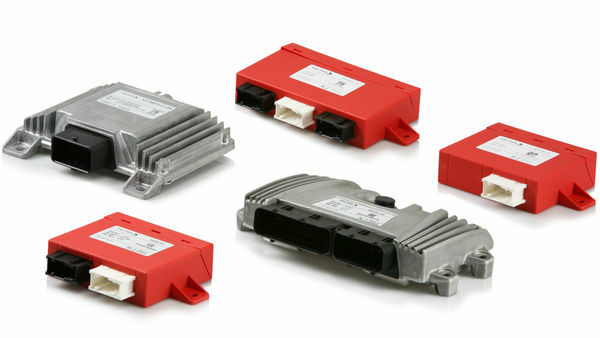 To test ECUs thoroughly, it is not only necessary to connect the communication networks to the test system, it is also necessary to connect the I/O interfaces. This task is handled by the Vector VT System. It simplifies the setup of test benches and HIL test systems immensely, because it integrates all circuit components needed to connect an I/O channel in one module. Examples of I/O channels are an ECU's output for controlling a headlamp or input for connecting a brightness sensor. 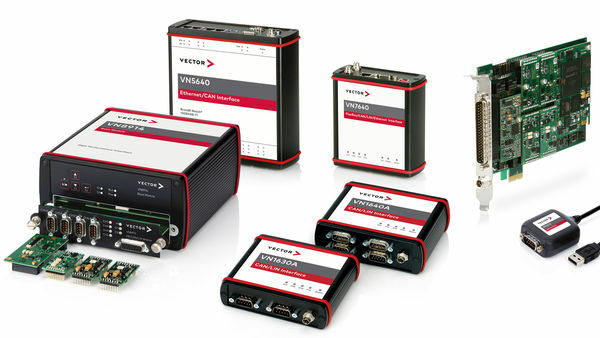 The VX1000 System is a scalable solution with top performance for your measurement and calibration tasks. It can be used in the vehicle – both in the interior and in the engine compartment –, on test benches and in the laboratory. The system forms the interface between the ECU and a measurement and calibration tool such as CANape. For high data throughput with minimal impact on ECU run-time, data is accessed over the microcontroller-specific data trace and debug ports.